You Have Been Watching…Carla’s Song | Scots Whay Hae! I hadn’t watched Carla’s Song since I saw it in the cinema in 1996 and for some reason I’d forgotten just how good it is. 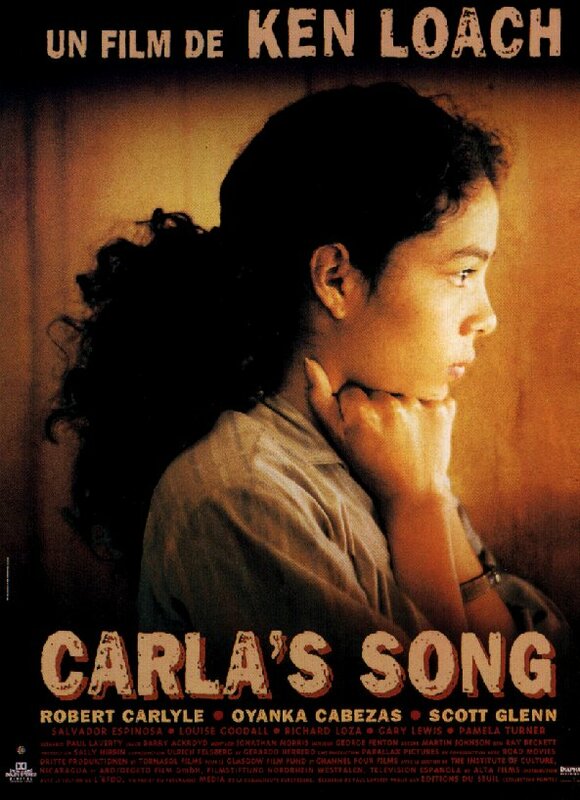 I’m a huge Ken Loach fan and return to his films regularly, particularly Kes, Riff Raff, My Name is Joe, Sweet Sixteen and Raining Stones, yet it never occurred to me to revisit Carla’s Song. That’s been my loss as it’s one of Loach’s best. It’s also one of Robert Carlyle’s best. Mainly due to the career making roles of Albie in Cracker and Trainspotting’s Begbie Carlyle is often asked to play characters who if they are not obviously violent, have the capacity for terrible deeds. There is no doubt that the man can exude menace with ease, but I think he is at his most engaging when playing decent, and he is never more so than as George Lennox in Carla’s Song, a man who takes it upon himself to be Carla’s saviour and finds himself in a country and conflict he doesn’t understand. He is matched by a beautiful performance from Oyanka Cabezasa as Carla, the mysterious woman who captures George’s heart. This was her first and last film role which makes her performance all the more extraordinary as she expresses the raw pain that accompanies the terrible trauma she has suffered in her home, the war-torn country of Nicaragua. But this is not a one note performance, and in those moments when Cabezas’ smile lights up the screen we can see the young woman that Carla was, and hopes to be again. There is solid support from Gary Lewis as George’s equally charming friend Sammy, Louise Goodall as George’s friend and fiancée Maureen, and particularly from Scott Glen as the ex-CIA man Bradley who is now helping the Sandinistas and reporting on the human rights atrocities that accompanied the conflict, and who is Eastwood tough as he tries to make George see just what he has wandered into. Glen is an American legend who has been in films as disparate as Nashville, Silence of the Lambs, Training Day and The Shipping News, and his casting here is inspired. But this is Carlyle and Cabezasa’s movie, and there is a real chemistry between the two as they try to come to terms with their relationship, the horrors of Carla’s past, and Nicaragua’s present. Ken Loach is one of the best film-makers of the last 50 years, and he obviously has an affinity with the West Coast of Scotland. As well as Carla’s Song and the aforementioned My Name is Joe and Sweet Sixteen Loach has also chosen Scotland as the setting for Ae Fond Kiss and his forthcoming film The Angel’s Share, which, like those earlier films, will be written by Paul Laverty. A new Loach film is always a reason for celebration, and I, for one, cannae wait.